What Should I use to Clean My AC Drain? 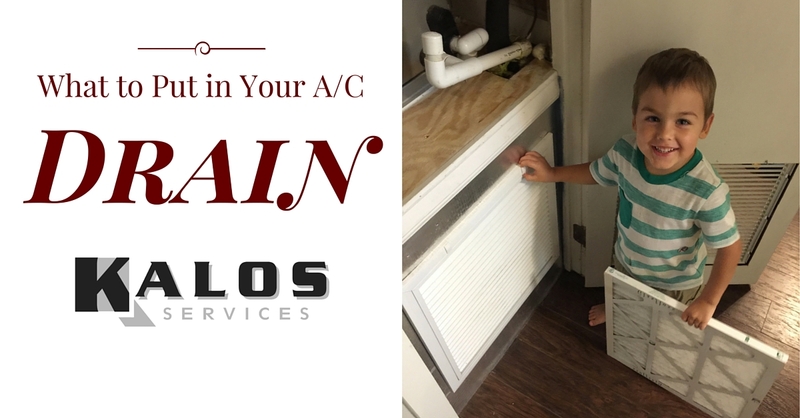 Kalos Services - 352.243.7099Air ConditioningWhat should I use to Clean My AC Drain? It is one of the most common questions we get throughout Central Florida “What do we put in the drain line to prevent backups and water damage?”. It’s a good question and it has a few good answers but we give our professional experience in the video below. When I first started in the air conditioning business I was working for a customer in Windermere and he told me “I know I’m supposed to put bleach in the drain but I don’t know where to pour it”. It turned out he didn’t have a drain clean out tee at all. I offered to install the tee and he agreed and then I showed him how to add white vinegar to his drain to keep algae and molds from thriving in the drain line. He was very pleased to learn that preventing water damage from drain backups could be so simple. Service Manager Nathan Orr shows how and what materials to use when cleaning your air conditioner’s drain line. If you’re a fan of ours, be sure to share this video to show your friends and family how they too can experience the Kalos difference. Today, we’re gonna be talking about steps you can take to ensure your condensate drain line stays clean between preventative maintenances, backups that either cause the unit not to run or get water at places. Pretty common question is, “Is there anything I can do to prevent this from happening?” We’re gonna head over to take a look at a unit, give a little demonstration of what you can do. All right so here we’re at the air handler. Condensate will collect the pan there in the bottom and it’s gonna drain out down the condensate line to out by the outside unit. Common occurrences that will get back up in here, you have to pull the switch, turn the unit off. If you don’t, it’s gonna damp water all over your floor. Pretty common question is, “Can I do anything to prevent that?” And what really causes the backups initially is the inside of PVC has a sleek oil-based coating so nothing normally clogs up. But over time, water sets in there, algae builds up, that’s what causes the initial clog. So you want something to do to break that up. But a lot of old school guys will say, just pour some bleach down, and the question is, “Does that help?” Bleach does help. The negative of bleach is that you can see here, your copper runs with the drain through a larger PVC pipe underground and comes up outside creating a hue that’s gonna collect anything at least in there. So as soon as your PVC had any leak where it goes underground which it shouldn’t, but frequently does, just a small leak, that bleach can collect in there, now it sets in your copper, it’s gonna corrode it, it’s gonna cause a leak right where you don’t want it which is underground where it’s irreparable. What we say then don’t use bleach, just use a little white vinegar. It accomplishes the same thing – kills the algae. Is it going to flush out dirt that’s build up in there? No. You’re gonna have to use a Shop-Vac or high-pressure air or something to blow that out. But what it does do is it gets rid of that algae, doesn’t give it a sticking point. And so regularly putting, you know, half a cup to a cup of vinegar down there, putting a little warm water on top of it, that will help flush out any of that algae that’s build up. Here, all we’ll gonna do is just take the cap off of your cleanup. It should have one somewhere. Put in a funnel, take your white vinegar, pour a good amount like I say half a cup to a cup, take your funnel out, cap it back up and you’re done. If you wanted to, you can flush it through with a little warm water to help maybe flush some of that algae out, but pretty much, you’re good to go. All right so in summary, don’t use bleach, use vinegar. That helps with any mildew growth, keep you running clean. It’s not gonna actually clean your drain, but it can prevent some backups. Visit KalosFlorida.com or call (352) 243-7088 for more information! More questions? Make sure to sound off in the comments or leave us a Voicemail. If you do, you might end up on our Podcast!